This lesson unit is intended to help you assess how well students are able to model a real-world situation and compare and critique sample models. In particular this lesson aims to identify and help students who have difficulty recognizing and using proportional relationships. 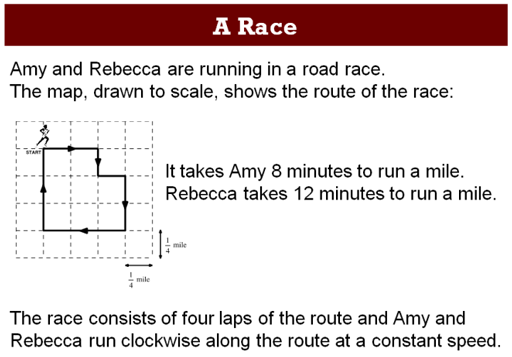 Before the lesson, students attempt the A Race task individually. You then assess their responses and formulate questions that will prompt students to review their work. Next, students work in pairs or threes to combine their thinking and work together to produce a collaborative solution to the task, in the form of a poster. Working in the same small groups, students evaluate, comment on, and complete some sample responses. Finally, in a follow-up lesson, students reflect on their work and what they have learned. Each student will need a copy of the A Race task, some paper to work on, a mini-whiteboard, pen, and eraser, and a copy of the How Did You Work? questionnaire. Each small group of students will need a large sheet of paper, copies of the Sample Responses to Discuss and one or two post-it notes. Spare copies of the task may also be needed. Calculators and graph paper should be made available upon request. 20 minutes before the lesson, a 100-minute lesson (or two 50-minute lessons), and 15 minutes in a follow-up lesson. Exact timings will depend on the needs of the class.